ch4 on beginning of round. 1 shell in ch1 space on last shell, sl st to top of ch3 on beginning of round. Fasten off. sl st to top of ch3 on beginning of round. * rpt from * to * to last 3dc and ch3 on round below, 1dc in each of next 2dc, skip 1dc, dcf around ch3 on round below, sl st to top of ch3 on beginning of round. dcf around next single dc, 1dc in each of next 3dc, * rpt from * to * to last 3dc and 1 single dc, 1dc in each of next 3dc, dcf around single dc, sl st to top of ch3 on beginning of round. dcf around next single dc, 1dc in each of next 4dc, * rpt from * to * to last 4dc and 1 single dc, 1dc in each of next 4dc, dcf around single dc, sl st to top of ch3 on beginning of round. Fasten off. to last 6dc and sl st, 1sc in each of next 6dc, sl st in sl st, sl st to first sc on beginning of round. Fasten off. Finishing - Sew in tie off all loose ends. 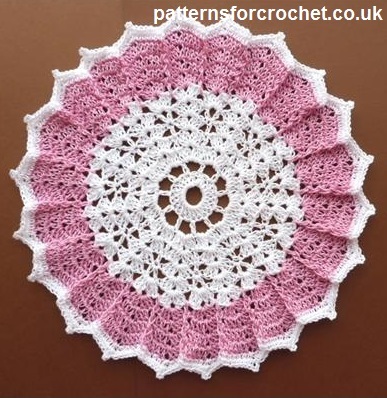 Hope you enjoy this free crochet pattern for table centre doily.